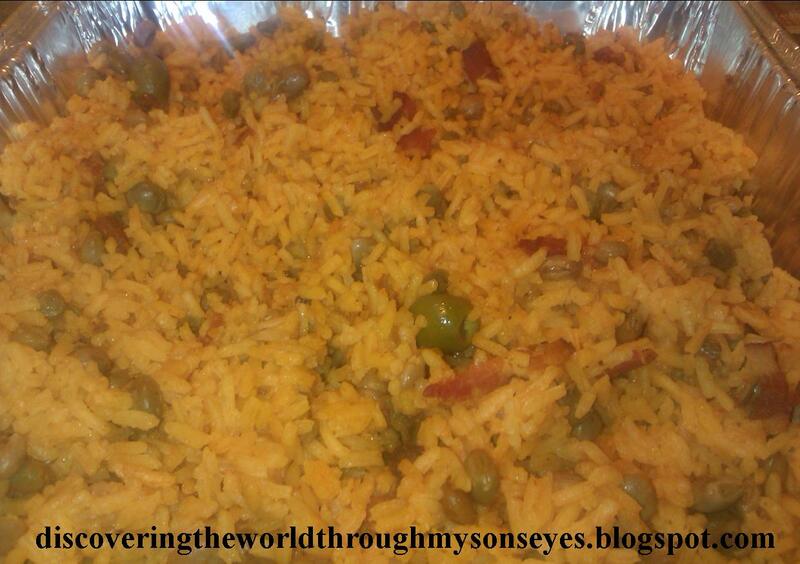 Today our world culture travels take us to Puerto Rico with Frances of Discovering the World Through My Son’s Eyes. Frances is a part-time blogger, mommy and wife of a beautiful multicultural familia. She has a Bachelor’s Degree in Business Administration with a certification in Human Resources. She blogs about discovering the world through her son’s eyes through everyday events, crafts, books, and travel as she teaches her son how culturally diverse our world is. Here are three posts from her blog you won’t want to miss: Teaching Heritage to Our Children, Fostering Childhood Friendship, and My Challenges Raising a Bilingual Child. This picture is posted under creative common rights. For link go here. San Juan is the capital of Puerto Rico, and it’s located on the northeastern coast of the island. Baseball is a very popular sport in Puerto Rico. Roberto Clemente is the island’s most famous baseball player. Isabela is best know for its large waves, making the small rural town in Puerto Rico an ideal spot for surfers. El Yunque is a Caribbean National Forest. It is the largest forest in Puerto Rico, and it is know for its many species of plants and animals. 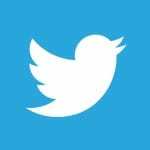 This picture is posted under creative rights. For link go here. La Cordillera Central is Puerto Rico’s central mountain range, one of the places where the red-flowered poinciana tree grows. 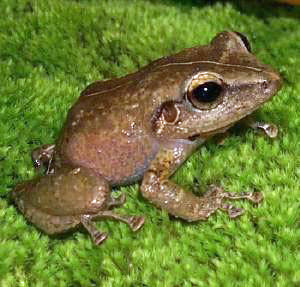 El coquí is a tiny tree frog named after the loud sound that it makes; it is also a symbol of Puerto Rico. This picture is posted under the creative common rights. For link go here. La Fiesta de Santiago – The Festival of St. James is celebrated in the town of Loíza with traditional music, such as bomba and the plena. El Festival Casals in San Juan is a celebration of classical music. It was founded in 1957 by the cellist Pablo Casals. Three Kings Day is usually the culmination of a holiday long celebration that starts on Thanksgiving Day. I share how we celebrate it here in the United Sates here. El Parque de Bombas in Ponce was a fire station from 1883 until 1989. Today it is a museum dedicated to the Ponce fire department. Ponce is a town that has been nicknamed The Pearl of the South because it is know for its fine architecture. El Viejo San Juan is known for its beautiful buildings and streets that reflect the Spanish colonial period. El Morro is a fortress built in 1539. It has six meter thick outer walls and its strategic position made it the most important Spanish fortress in the Caribbean. Circular sentry boxes, or garitas, provided shelter for guards, and have become the architectural symbol of Puerto Rico. Las máscaras de vejigante – Vejigante masks can be made out of dried coconut shell. They sometimes have horns and are often painted black or red. La cultura Taína – The Taíno culture was the dominant culture of Puerto Rico before the arrival of Christopher Columbus in 1493. Puerto Rico’s pre-Columbian heritage can be seen in Taíno art. 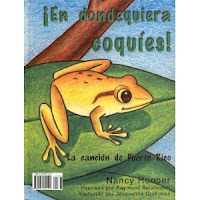 This is a beautiful book about the most famous tree frog from Puerto Rico: En dondequiera coquies/Every where coquis by Nancy Hooper. The book is in Spanish on one side, and you turn the book, and its in English on the other side. Another colorful children’s book about Puerto Rico is On This Beautiful Island by Edwin Fontánez. This book comes in English and Spanish. A story about the Taíno Indians: Atariba & Niguayona: A Story from the Taíno People of Puerto Rico. This book has a side by side translation. A story about Puerto Rico’s Nature: Mi isla y yo / My Island and I: La naturaleza de Puerto Rico / The Nature of Puerto Rico. This book is in both English and Spanish. Thank you, Frances, for this wonderful introduction to Puerto Rico! What a beautiful country, and that fire station is amazing. I’m really looking forward to reading the picture books you recommend with my kids! 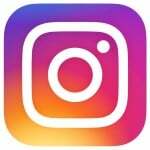 Are you interested in writing a post for my Exploring Geography series? 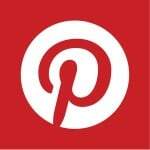 Email me at mamasmilesblog at gmail dot com. 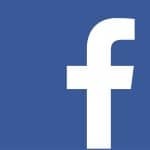 You can see all of the posts for this world culture series here! Awesome! We have a spanish children’s song called El Coqui. Probably from Puerto Rico? Lovely post! I really want to visit Puerto Rico. I’m adding those books to our list. What a great and comprehensive post! I really enjoyed traveling to Puerto Rico with you through your post! The coat of arms is beautiful too! I didn’t realize how intricate it is. Their seal is so cool! My husband just asked me if I wanted to go to Puerto Rico on vacation. Now I read your post. This is fantastic. It’s like I was there its so picture-tastic! I didn’t know most of this about Puerto Pico. Thanks for an interesting and informative post! Puerto RICO – sorry for typo! Thank you Erin! There’s so much to learn about Puerto Rico, and it’s culture. Although colonized by the US, it still keeps it’s on culture intact. (Well almost, because we do celebrate a lot of the US holidays). I would love to visit Puerto Rico, the food alone would be worth it! And of course us Wallworks love our beaches. Ah Marie the beaches alone are a beauty! I used to get off from work, and go straight to the beach. Just to simply sit there, listen to the waves, and relax! Lovely post Frances – I would love to visit Puerto Rico and that stunning forest! I’m also looking forward to reading these children’s books you shared and one of these days I’m going to try some of your recipes! Thank you Jody! Puerto Rico is indeed a beautiful island. The books would make a wonderful addition to your collection. What a great peek at Puerto Rico! Thank you Jen! You should visit Puerto Rico you’re going to fall in love with the island! Wonderful post! My interested in Puerto Rico was piqued after reading a children’s book called Martina Finds a Shiny Coin by Yadhira Gonzalez-Taylor. It’s based in a tiny village called Borinquen and the vivid descriptions of the local culture make you feel like you are visiting the island. It’s a lovely story about being true to yourself. Thought I would share the recommendation for anyone interested in Puerto Rican picture books. Thanks for the recommendation! I’ll look for a copy to read with my kids.